"Our analysis shows that the warming structure in the recent period (roughly from 1998) differs greatly from that in the earlier period. In the recent period, the surface was not clearly warming in summer, and 500 hPa air became colder in autumn. Before 1998, however, all the layers at 500 hPa or below were warming." Therefore, the authors find clear evidence of a pause of Arctic warming and even cooling during autumns since 1998, and no change during summers, in contrast to an Arctic warming trend in all seasons from 1979-1998. 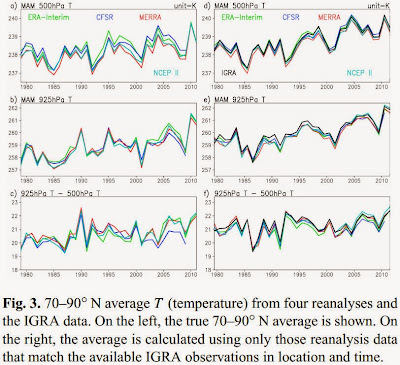 According to the authors, "Our analysis shows that the warming structure in the recent period (roughly from 1998) differs greatly from that in the earlier period." The findings differ substantially from the new warmist study by the SkS secret forum participants Cowtan & Way that claims to get rid of the 17+ year pause in global warming by a reanalysis of extrapolated Arctic data. The authors advise "extreme caution" in using reanalyses of Arctic temperatures, such as has been done by Cowtan & Way, stating, "Our results also suggest that studies of the Arctic climate based on reanalyses should be undertaken with extreme caution." Cowtan & Way also inexplicably show all of their 'adjusted' Arctic temperature increase occurred after 2005, but this new paper, based strictly upon confirmable observations, shows no warming in the annual data and possibly even Arctic cooling on a annualized basis since 2005 [Fig 4d below showing only reanalysis data that can be confirmed by nearby observations]. In this study, we have examined the Arctic warming structure from 1979 to 2011 in observations and reanalyses. Our analysis shows that the warming structure in the recent period (roughly from 1998) differs greatly from that in the earlier period. In the recent period, the surface was not clearly warming in summer, and 500 hPa air became colder in autumn. Before 1998, however, all the layers at 500 hPa or below were warming. These findings are supported by multiple reanalyses together with observations. The cooling trend in both observations and the reanalyses at 500 hPa in fall since 1998 has not been sufficiently recognized in earlier studies. 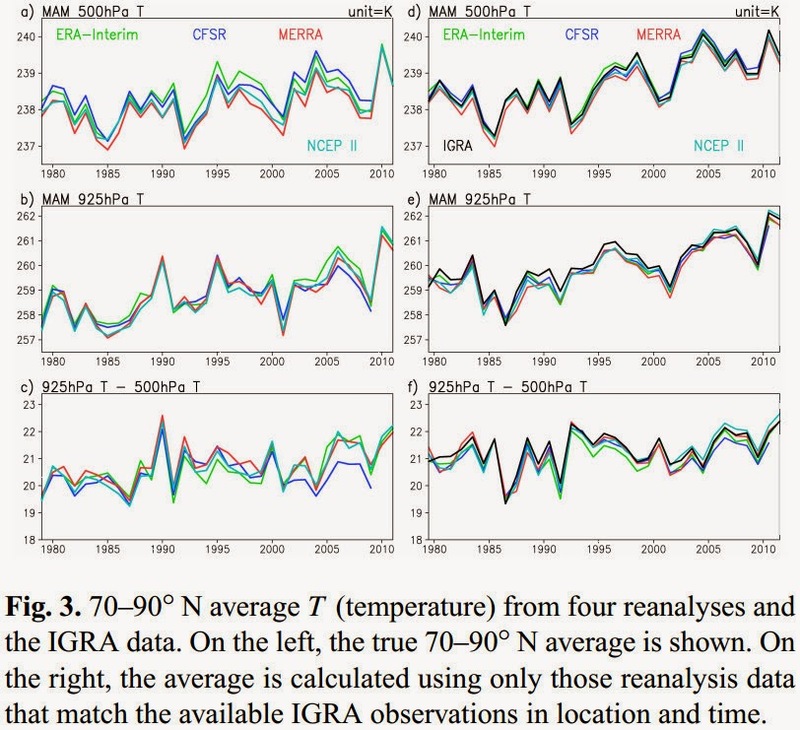 While examining the warming structure, we have also examined the validity of the reanalyses in surface-air and upper-level temperatures.We have shown for the 1998–2011 period that all the reanalyses reveal warming trends at the surface in all the seasons, while GISTEMP shows no trend in summer. At the 925 hPa level, CFSR shows larger Arctic mean bias than NCEP II in summer (especially after the year 2000), although CFSR is supposedly an improvement over the NCEP II. This CFSR error was shown to arise primarily from the 120 W–0 longitude band. It is our hope that this study will stimulate further investigations into the root cause of the reanalysis errors and biases. Our results also suggest that studies of the Arctic climate based on reanalyses should be undertaken with extreme caution." Abstract. There has been growing interest in the vertical structure of the recent Arctic warming. We investigated temperatures at the surface, 925, 700, 500 and 300 hPa levels in the Arctic (north of 70° N) using observations and four reanalyses: ERA-Interim, CFSR, MERRA and NCEP II. For the period 1979–2011, the layers at 500 hPa and below show a warming trend in all seasons in all the chosen reanalyses and observations. Restricting the analysis to the 1998–2011 period, however, all the reanalyses show a cooling trend in the Arctic-mean 500 hPa temperature in autumn, and this also applies to both observations and the reanalyses when restricting the analysis to the locations with available IGRA radiosoundings. During this period, the surface observations mainly representing land areas surrounding the Arctic Ocean reveal no summertime trend, in contrast with the reanalyses whether restricted to the locations of the available surface observations or not. In evaluating the reanalyses with observations, we find that the reanalyses agree better with each other at the available IGRA sounding locations than for the Arctic average, perhaps because the sounding observations were assimilated into reanalyses. Conversely, using the reanalysis data only from locations matching available surface (air) temperature observations does not improve the agreement between the reanalyses. At 925 hPa, CFSR deviates from the other three reanalyses, especially in summer after 2000, and it also deviates more from the IGRA radiosoundings than the other reanalyses do. The CFSR error in summer T925 is due mainly to underestimations in the Canadian-Atlantic sector between 120° W and 0°. The other reanalyses also have negative biases in this longitude band.